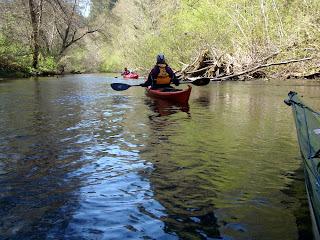 The wind has been howling on the Mendocino Coast but we've found a peaceful paddling refuge on the Noyo River. At times we bemoan the wind for interfering with our plans of whale watching, surfing, and coastal paddling; but we also appreciate it in the bigger scheme of things. The winds are essential this time of the year for upwelling nutrients in the ocean and are great for drying out our favorite mountain biking trails. They also have given us reason to kayak on the Noyo River more. The Noyo River is beautiful in spring. It's beauty extends beyond greenery and blooms to the sounds of song birds and the ethereal feeling of spring. A perfectly timed paddle with the tide and the efficiency of our sea kayaks make the experience effortless and dream-like. Of course we enjoy being entertained by the wildlife. 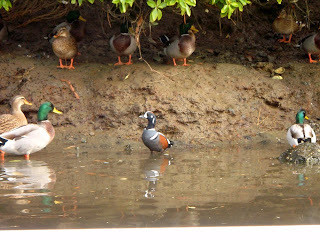 Curious harbor seals follow us about and we are still regularly seeing "Cate's Odd Duck" (a lone harlequin duck). The osprey have returned and have discovered that a large white goose has taken up residence in one of their prominent nests. We are curious to see how long this situation remains. While I have not been successful in my goal this spring of videoing whales from my kayak, I happened to catch a river otter scampering on the bank with my camera. As the winds continue, I hope to capture some more footage of our wildlife on the Noyo River. Wow, I can't help but think how lucky I am to have all of this in my backyard and to be able to share it with others.